I’m finding myself becoming determined to complete this challenge. I have booked various Friday’s off work, and I check the weather early in the week to confirm whether to go or not. After two outings to Tignes, this month it was time for pastures new, so off I went to Saas Fee. 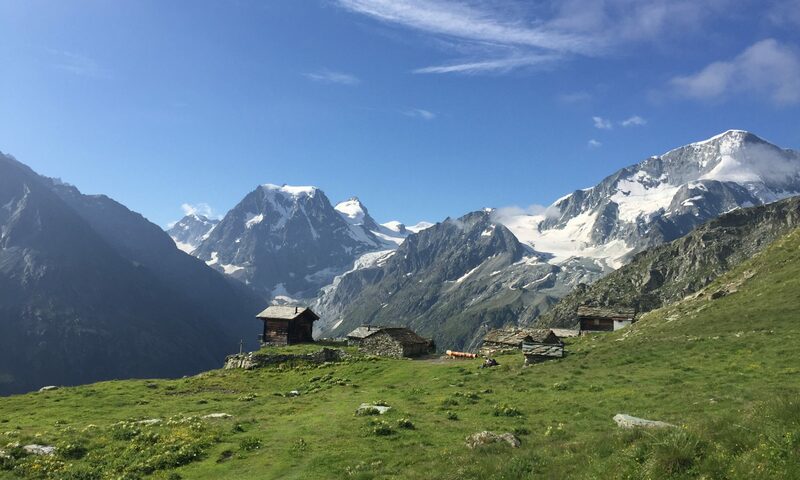 In fact this was my first time to Saas Fee – a car free village near Zermatt. The road leads right into the carpark, from where it is a short walk to the village and lifts. The village is picture postcard. The skiing also looked promising, with the car park populated with the minibuses of the Slovak, Czech, Russian, German and Swiss ski or snowboard teams. In addition to the ski teams practicing slalom there was a group of 30 canadian teenagers who were based at Saas Fee for two months. I presume that they have the winter games at Sochi in their sights. At the time of writing they have 1992 days to go… I also met a Brit who was on a ski course for the week – he told me that it was the start of his season. I wondered where in the cycle I was. The summer skiing area is at 3500m, where there are 3 T-bar tows. The skiing was varied, and whilst the race teams took up quite a bit of the slopes, they started packing up at 11 o’clock and so it was then possible to ski on the areas they had been occupying which were virtually in pristine condition. On the slopes were the Swiss Paraplegic Association and a group of skiers some with one or more limbs missing, and others who were partially sighted (being individually guided down). It was very refreshing and inspiring to see them blasting down the slopes at high speed. Also adding to the atmosphere were parties of climbers snaking up to the top of the 4000m+ peaks towering above. I find the presence of climbers in the vicinity of ski slopes provides a reminder of the accessibility of wilderness and yet how far away from it I am compared to the climbers just a kilometre or two away. I keep telling myself “one day”. The snow was in pretty good condition, but by 12.30 the clouds started bubbling up and wisps of cloud enveloped the slopes, so I called it a day. I did about a dozen runs. This blog is definitely missing some photos. Daughter No1 had gone off on holiday surfing and taken my camera, but as C later pointed out, if I had had the camera I would have probably taken some boring long range shots of snow, mountains and skiers in the mid distance. You can imagine that kind of stuff yourselves… C is the photographer of the family so I should get her along again. A place to highlight days out and longer expeditions into the hills and mountains.